Crude oil once again failed to take advantage of the strong momentum it got at the beginning of the week trying to break above the $58 level with no success and went into new lows. The sharp sell-off is likely a result of growing concerns that supplies would exceed demand in 2019, according to Goldman Sachs. Another factor must be taken into consideration also and that is that the fall in prices also reflects low trading liquidity ahead of Thanksgiving as growth concerns continue to mount. We expect high price volatility until evidence that oil market fundamentals are improving, requiring a decline in OPEC production, signs that demand growth is resilient. Prices were unable to break above the $58 level despite the positive push US Oil got at the beginning of the week. The price is now printing new lows at $52.75 per barrel. 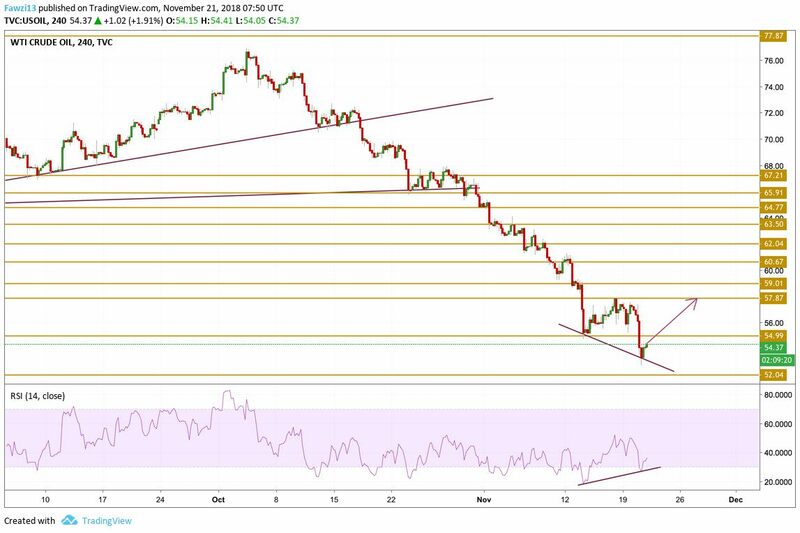 However, the one thing that cannot be missed is the huge divergence between the price and the momentum presented on the chart that might trigger a rebound for Crude oil from a technical standpoint. The level we will be focusing on next is the $57.87 resistance level.